What Do We Mean by Yoga Practice? If you’ve ever taken a class at a yoga studio or thumbed through Yoga Journal, you’ve probably heard doing yoga referred to as a “yoga practice.” But why do teachers and yogis go through the trouble of making a distinction between doing the asanas (poses) and practicing them? It can be a big mental distinction, and knowing the difference just might change your yoga practice. When we say we’re practicing something, it implies that we’re on a journey to get better at whatever it is we’re practicing. That emphasis on the journey is a very important distinction, especially when it comes to practicing asana. The yoga poses are just one of eight limbs of yoga, so that distinction can help remind us that yoga is a process. It’s not about rushing to get to a pose that our ego tells us we want to do, it’s about taking the time to learn more about ourselves and our bodies as we work to get to that pose. Why do we say that we “practice” yoga? Even though we may be trying to find good alignment in a pose and quiet our minds as we do it, our pose may (and likely will) look different every day, and that’s okay. It’s okay to fall out of a balancing pose. It’s all part of the yoga journey, the yoga practice. We won’t ever really perfect a pose, we’ll just get very good at practicing it. One of the best lessons that we can learn from yoga is that each day is different, and knowing that you don’t have to work to live up to who you were yesterday can be so liberating. There’s no need to obsess about how we couldn’t hold a pose in class today that’s normally very easy. Let go of those thoughts. Learning to fall out of a pose is also part of the journey, the practice. Letting go of thinking that we should be at one place on our yoga journey when we’re actually at another is so important. Our minds will tell us stories and it’s good to learn not to listen. Ultimately, so much of the yoga journey is learning to be present and not to worry about where we feel we “should” be, in our yoga practice and otherwise. So, the next time you’re on your mat, I encourage you to start thinking of that time as your practice. Let go of where you think you should be on your yoga journey and focus on the process. I think you may just appreciate your practice a little more when you let go of the expectations of what it should look like and just enjoy the journey. Yogis: do you make the distinction of practicing yoga? How do you help remind yourself to enjoy your journey? So interesting. After close to a decade I am still a raging newbie with yoga. Thanks, Carla! I always feel like such a newbie, too–so much to learn! I like calling yoga a practice, because that gives me the opportunity to continue to grow and improve. I enjoy being a student of yoga, and after almost 20 years of practicing yoga, I continue to learn and grow. Love that phrase–being a student of yoga–because we really all are students, aren’t we? I tend to think of myself more as a guide than a teacher when I’m leading classes. 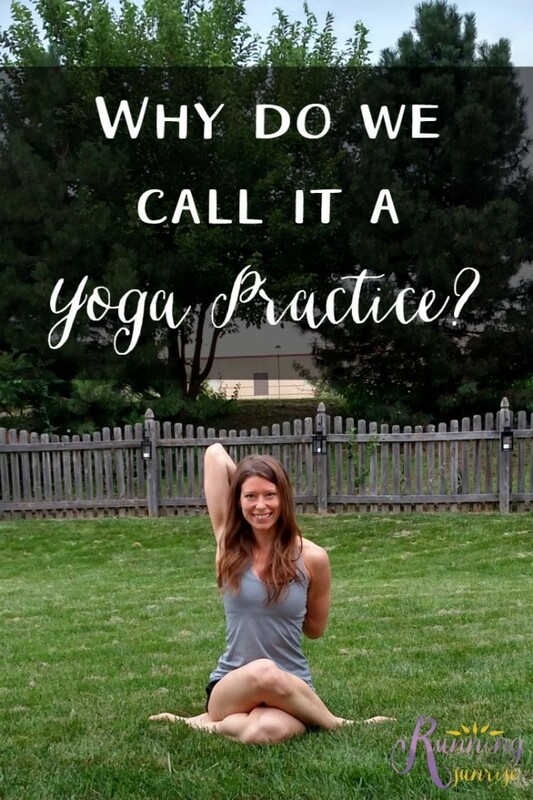 Yes, I’m calling out the poses, but who am I to tell people how to practice their yoga? I’m just there for suggestions. Couldn’t agree more. There are times when I do yoga (using the poses as part of something else, like stretching for a run) and there are times when I practice yoga (when I am moving through the poses or just practicing my breathing, for the sheer sake of yoga and finding where I am in my life). Yes, exactly! Love this–great point, Suz! There’s definitely a distinction, even within yoga, and you’ve articulated it really well. Thanks for adding to the discussion! Beautiful, Ashley! I completely agree–I feel like my most successful yoga sessions are the ones where I turn off my brain, regardless of what my poses might look like. I obviously can’t remember where (or when) I read it, but I recall reading an article that talked about the distinction between calling something a practice (like yoga) and exercise (like running). The gist was that by calling it a practice people were more motivated to do it because it didn’t feel like something they had to do. That’s an interesting thought! Although you could definitely call running a practice by those terms. I suppose cross country and track athletes have “practice,” so why should recreational runners be any different? I’d actually never really thought about the difference… but I totally get it! Great post! I really like the idea of calling yoga a practice. I’ll never be 100% perfect in some poses, and there are some poses that I likely will never be able to do. Still, with any practice, it’s not about being perfect, it’s about reaping what I sow. It is SUCH practice. And it doesn’t get better unless it’s part of my routine! I’m noticing some small but cool changes in my body (and mind) that wouldn’t have happened if I didn’t PRACTICE.